Years before Deadpool and Logan broke the R-rated comic book movie barrier, there was Dredd, a second attempt at bringing the comic book character Judge Dredd to the big screen. Although movie audiences largely ignored this film, it has become a cult classic and, thanks to Karl Urban’s performance as the title character, is a much grittier and faithful adaptation. In the not too distant post-apocalyptic future, many of the major cities have been merged, now referred to as “Mega-City One” and so forth. And in this city, a new drug is on the rise, known as Slo-Mo, that decreases one’s perception of time to 1%. When Ma-Ma (Lena Headey), the drug kingpin who controls Slo-Mo from within the high-rise Peach Trees apartment and shopping complex, is double-crossed, she has the three men skinned, dosed with Slo-Mo, and tossed over the railing of the top floor, their bodies hitting the atrium like sacks of wet cement. Sent to investigate are Judge Dredd (Karl Urban) and rookie assistant Anderson (Olivia Thirlby), a mutant with psychic abilities trying to pass a training mission. Dredd and Anderson take Kay (Wood Harris), a member of Ma-Ma’s gang, into custody. When Anderson uses her psychic abilities on Kay, she learns that he was the one who hurled the victims to their deaths. Ma-Ma soon learns of Kay’s arrest, has her computer hacker (Domnhall Gleeson) lock down Peach Trees, and orders a bounty on Dredd and Anderson. With Peach Trees locked down, Dredd and Anderson are cut off and unable to call for backup, and rather than take cover and wait it out, they begin their ascent to the upper floors, encountering shootouts with gang members, before making their way to the top and a showdown with Ma-Ma. It is this simplistic approach, a somewhat “day in the life” storyline, that helps Dredd work where 1995’s Judge Dredd, with Sylvester Stallone, failed. This is a much smarter script, written by longtime Judge Dredd fan Alex Garland (Sunshine, 28 Days Later, Ex Machina), not always going for the one-liner and more interested in character and story. Karl Urban completely owns the character of Dredd, what some may dismiss as a one-note performance, but it is that one-note that Urban maintains behind a helmet that only exposes his mouth throughout the film that makes Dredd such an interesting character. Anderson is the audience’s entry into this world, and Olivia Thirlby provides an innocence and naivete that later matures to show her character’s potential as a judge. Finally, Lena Headey is much more sadistic and uncaring as Ma-Ma when compared to her now signature role as Cersei Lannister on Game of Thrones, and is a perfect adversary for Judge Dredd. The action sequences are ultra-violent, but never to the point of being over the top and humorous. If Dredd were released today, in a post Deadpool and Logan era of R-rated comic book sagas, it would probably have been a major box office success. Dredd was captured mostly in 2K (in native 3D) on customized Red One MX cameras, and completed as a 2K digital intermediate. That has been upconverted to 2160p and color graded using HDR10 for this new UHD release. There is a subtle increase in fine detail, noticeable mostly in Karl Urban’s beard stubble and Lena Headey’s facial scars in close-ups and floating dust particles as well as textures in the uniforms and costumes. There is also a noticeable increase in visual noise in some of the darker sequences that was only slightly viewable on the Blu-ray (both in 2D and 3D). Blacks are more inkier with some additional shadow detail, but where the HDR really shines is in the drug-induced POV shots that are much more vivid and detailed than they appeared on the Blu-ray. Although not mentioned on the cover, the included Blu-ray edition is the same 2D/3D hybrid disc that was released in 2013, so the 3D version is included here. Depth behind the screen is the main focus for much of the film, and comes off quite nicely. The 3D is more immersive during the drug-induced POV sequences, with exaggerated depth and floating dust particles and water droplets often appearing in front of the screen. 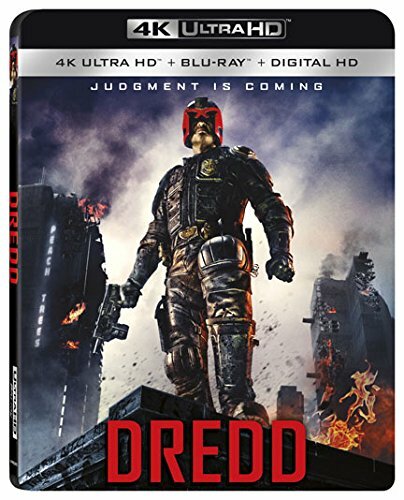 When Dredd was released as a 2D/3D Blu-ray hybrid disc in 2013, it was fitted with a very immersive DTS-HD MA 7.1 track that was mixed to be compatible with DTS Neo:X 11.1. Lionsgate has upped the ante for this UHD release with a new Dolby Atmos mix that is demo-worthy. LFE is much more expressive, but is never boomy. Gunshots, explosions, falling debris come from all around you, even when played back in a 5.1 configuration plus front heights with Dolby Pro-Logic IIz enabled. Dialogue is clear and understandable throughout, never overpowered by effects or music. As with most Lionsgate UHD releases, all of the special features have been ported over and are accessible from the UHD disc. Mega-City Masters: 35 Years of “Judge Dredd” (1080p; 14:27): A look at the history of the character, although no mention is made of the 1995 film. Day of Chaos: The Visual Effects of “Dredd” (1080p; 15:21): A look at the visual effects created for the film, including the Slo-Mo POV sequences. “Dredd” Featurette (1080p; 1:53): A behind the scenes EPK trailer. Dredd’s Gear (1080p 2:31): A look at the uniform. The 3rd Dimension (1080p; 2:00): A look at the process and cameras customized to shoot the film in 3D. Welcome to Peachtrees (1080p; 2:33): A look into the production design of the mega high-rise. Dredd Motion Comic Prequel (1080p; 2:57): A brief backstory in Ma-Ma and the development of Slo-Mo. Dredd was, perhaps, ahead of its time, what with the success of more recent R-rated comic book movies such as Deadpool and Logan. This new UHD release contains a nice video upgrade and a killer, demo-worthy Dolby Atmos track, plus includes all of the special features AND the 3D version of the film. Man I can't wait to watch this in 4K. I'm definitely looking forward to this 4K disc!